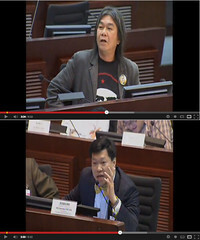 After watch this f-bomb ladened debate in the Legislative Council of Hong Kong, Some people may have a point in thinking Lawrence “F-bomb dropping” Ma Yan-kwok (馬恩國) may have single-handedly raised Leung Kwok-hung’s (長毛 Long Hair) approval ratings! Have a watch of this LegCo video recording of the heated exchange and decide for yourself. Feel free to check out my first documentary Long Hair Revolution (長毛革命) which I’ve finally got it fixed and viewable on YouTube some weeks ago. Enjoy. For more info about Long Hair Revolution (長毛革命), read it here. 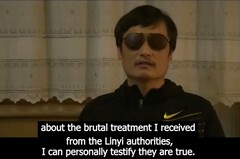 Crisis: Will blind lawyer Chen Guangcheng break through Chinese dark cloud of lawlessness? In Chinese the word “crisis” is “危機”, a word compose of two parts, “危” for danger and “機” for opportunity. I am serious when I asked “Will blind lawyer Chen Guangcheng (陳光誠) break through Chinese dark cloud of lawlessness?” As if by chance (and I don’t believe in “pure chance”), Guangcheng‘s Chinese name is “光誠”, “光” is light and “誠” for frankness. I am keeping my fingers crossed for all parties involved, for Chen and his family members and supporters, for the US and Chinese governments, and for the powerless Chinese citizens that rights lawyers like Chen are trying to help in China! Note: I think the following WaPo and CBS reporters underestimated Chen‘s desire and determination to stay in China to help powerless Chinese citizens. Chen in his own words. Few days ago, I posted the following challenge and hoped someone would notice what was going on and we could have some fun in the discussions. Try to state what you see in the video clip and explain why. Bonus points: explain what you don’t see but can imagine happen. Well, it is time to post my observation/solution. Points noted in Haricot’s & hevangel’s comments. – it was a “free” sample tasting. – The girl gave money (pennies, nickels, or dimes) to people for them to give the coins right back to her before they take their drinks. Additional points not covered in posted comments. – To me, the key issue not covered in the comments was why the girl gave people (I will call them the “samplers”) the coins, so they can give the coins back to her before taking the drinks? – To me, what was happening was the artificial creation of a contract and the money (a penny/nickel/dime) was the “consideration“. I bet some “smart” lawyers must have cooked up this “contract” to try to solve some “problem”.